I love seeing movies that are based on books. Because let's face it, if you're a writer, that is like the ultimate dream-- to see the characters you've only ever seen in your head, played out on the big screen. 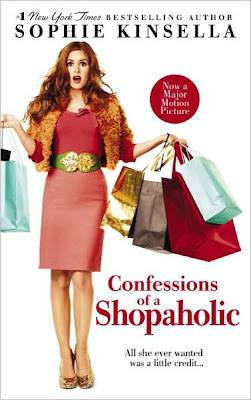 So, tonight I saw "Confessions of a Shopaholic" based on the novel of the same name by Sophie Kinsella. And I must say I thoroughly enjoyed myself. It was cute, clever, and clean. And oh so funny. Wasn't a huge fan of Hugh Dancy before this, but his adorable British accent, and charming personality won me over. By the end of the movie I was thinking, yeah, he's pretty hot. So, anyway, if you want to be entertained and not have to worry about shielding your eyes in discomfort (like I had to do at a movie last week) then this is a must see. Really? REally? It was good? I've been a little bit afraid to see it.. and Hello? NOT a hugh Dancy fan? Hehehe! He did so good as Prince Char in Ella Enchanted! LOL! I loved his accent! Of course, I was living in Portugal at the time... we'll see how he fairs now that I live in england and hear that accent everywhere! DD said it was a feel good flick. I enjoyed it. It was definitely a cute film. Love me some Hugh Dancy. And that girl who played the lead was adorable. I've been waffling as to whether I want to see it or not. As a pureblood NON shopaholic, I'm pretty sure I won't be able to relate to the main character. Speaking of book made into movie ... speaking of hunks, has anyone seen the new movie with Brendon Frasier? I don't remember the name of the book or the movie, just that my eye-candy stars in it. I can't wait to see it. I thought it looked cute from the preview. I like Hugh Dancy. Now I have to go find that version of Daniel Deronda Renee was talking about. Nothing like a classic and a cute guy! Tricia, that's Inkheart. Also a very cute, clean movie. I wanted to see this movie but was afraid it would be dumb--glad it wasn't and will add it to my rental list. Jenni, yes, it was super cute. And I know, Hugh Dancy, he was in Ella Enchanted (love that movie) but I just wasn't sold on him. But, now I am. Angie, it was I felt great. Nat, I know, Isla Fisher did a great job. Renee, yeah, I'm not a shopaholic either (in fact, I'm style challenged) but it was super cute and funny. Tricia, I had no idea what movie you were talking about, so thanks Nat, for providing the name. After Natalie said, Inkheart, I was like, oh, of course. Anyway, yes, Brendan Fraser is a cutie. Candi, I know, when Renee mentioned that movie I was like, we should get together and watch it. Terri, yeah, I thought it might be dumb too, but I was pleasantly surprised. You'll like it. Thanks for the review! Im going! PS I miss you! Want to come to AZ? Jenny, I always want to go to Arizona. LOL Are you coming up with a good excuse for me? I was so bummed when you guys didn't come. What's up? Tyler has to work or something? Come on. Working is overrated.